This space receives so many comments from brain-dead socialists whose arguments always reduce down to the same whine "Let the government do it." I have penned a canned response I often use. Libertarians should feel free to borrow it and use it in response to asinine comments from socialists. You always use the classic reasoning used by totalitarian socialism (see the socialist trio of atrocities at http://rexcurry.net/socialists.jpg). If the issue is education, food, clothing, shelter, TV, widgets or any goods or services, then a freedom advocate will point out how people provide for needs in a free market economy, and the response of the classic totalitarian socialist is that everything that people have in a free society can be provided by a totalitarian government because "Don't government providers have to answer to citizens too? Or at least to the provider board, who the citizens elect?" It is frightening how commonplace that response has become and how the people who provide that response to one subject (e.g. 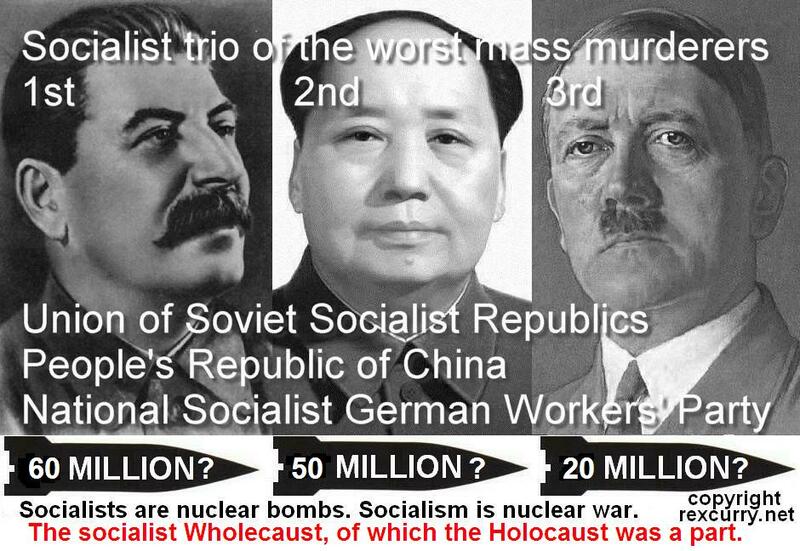 schools) NEVER OPENLY expand the response as was done in the socialist trio of atrocities (the former Union of Soviet Socialist Republics, the People's Republic of China, the National Socialist German Workers Party) and their lessers (Cambodia, India, Cuba, third world countries etc.). It is as if the people who use that simplistic response do not know all the horrible ideologies that have used that same response. Very frightening. Every "problem" is perceived by you to need more government action, more government spending, more taxation, more government programs, more laws. My views are the opposite. Your views resemble the reasoning of totalitarian socialism. When "problems" continue to grow, to you it is another excuse for yet more government action, more government spending, more taxation, more government programs, more laws. My views are the opposite. Your views resemble totalitarian socialism. Every problem you perceive is actually a result of, or was worsened by, government action, government spending, taxation, government programs, more laws. Because socialism is the use of government violence and theft, it encourages businesses to follow the socialist example. Anyone who wants to use government violence and theft, whether he is a single individual or part of a business, will support socialism. Socialism corrupts business in the same way that your views corrupt the rest of society, by promoting in business the use of more government action, more government spending, more taxation, more government programs, more laws. My views are the opposite. Your views resemble the reasoning of totalitarian socialism. Socialism not only grants monopoly powers to businesses, it provides government contracts, government funding, tax subsidies, government programs, and protective laws. Socialist laws and bureaucracy make it too expensive for small or new businesses to compete with older established bigger businesses. Socialism corrupts businesses and teaches them to use the government violence and theft that is socialism. All the "problems" you perceive were created by socialism. And your solution is never to reduce the government and end the socialism, it is to layer on even more government action, more government spending, more taxation, more government programs, more laws. You have no end in sight. That is why your views resemble the reasoning of totalitarian socialism. 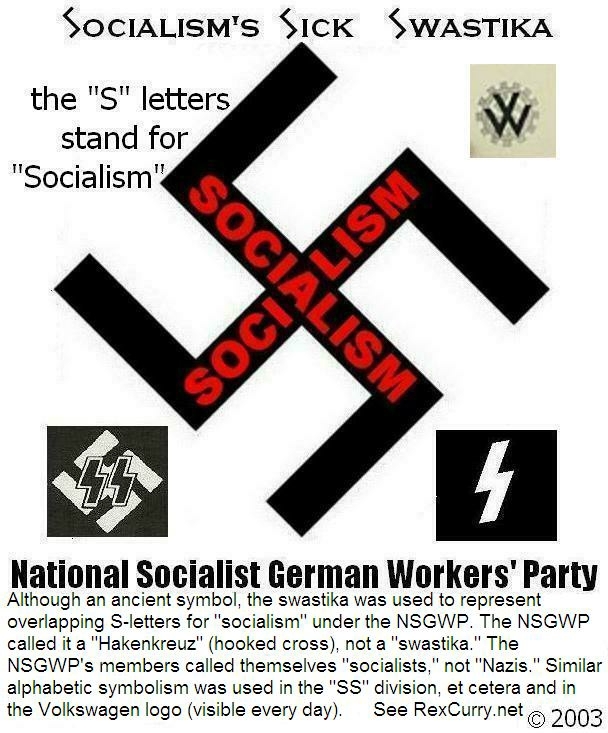 Worse still socialism will sometimes go farther and take people from a market economy and give them government positions, and/or government powers, in "government" services, with government spending, from taxes, to operate the service or provide the good as a government monopoly. You believe that either a government monopoly or government-controlled private monopoly would mean greater efficiency, less waste and better living. You assume government officials have superior knowledge about the desires of customers, the competence of entrepreneurs, the quality of service offered, the potential of new technologies and other factors. You further assume that established firms contribute more than new entrepreneurs. Finally, you assume that even if government officials know what they are doing, that they won’t be corrupted by lobbyists from established firms who want to suppress competition. None of these assumptions is correct. Often, you do not even know when you are doing any of the above. Worse still, when you are doing the above, you believe that you are accomplishing the exact opposite. 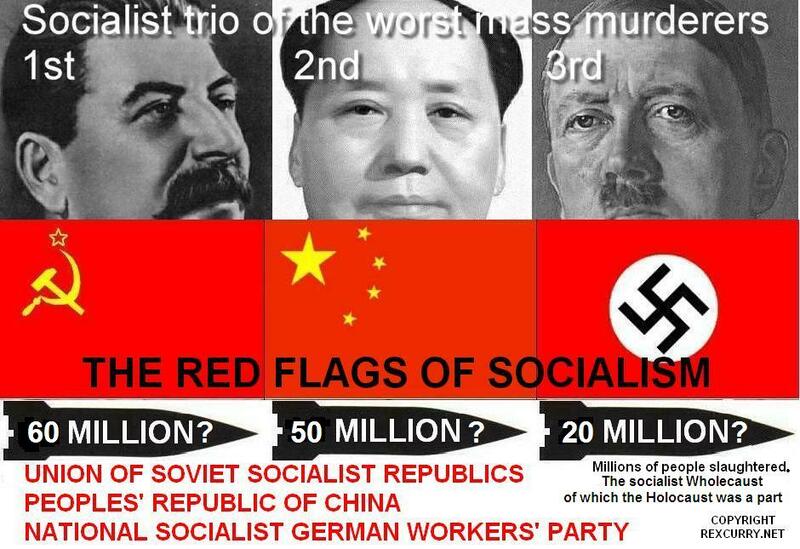 That is the trademark of the socialist trio of atrocities (the former Union of Soviet Socialist Republics, the People's Republic of China, the National Socialist German Workers Party at http://rexcurry.net/socialists.jpg ) and their lessers (Cambodia, India, Cuba, Korea, third world countries etc.). You do not think philosophically about the range of your own comments, and you simplistically rubber-stamp government programs that others start (because you are not enough of a creative thinker to come up with your own ideas). Point to any website or even other group posts where you attempt to explain any political philosophy or philosophy of government that you hold (you hold none, and the default is rubber-stamp statism) or point to any philosophical defense of liberty (calling for the reduction of government programs, laws, socialism) that you have ever made. You can point to nothing. You are a rubber-stamp statist who uses cliches that are used by totalitarian socialism. Socialists are wimps. They don’t have the guts to personally take money and property from other people. That is why they have the government do it for them. A search for the phrase “socialists are wimps” on the web and newsgroups reveals that http://rexcurry.net is one of only three locations to express the sentiment, and is the only site to express the sentiment in the manner above. There is one other website that came close with the phrase “democratic socialists are cowards.” The sentiment also applies to republican socialists who are outspending the socialist Clinton by more than double. The headline of your report on Mayor Lawrence Morrissey of Rockford, IL, spending time in Washington begging pooh-bahs there for money speaks volumes: "Wish List in Hand, Mayor Travels to Washington and Finds He’s Not Alone" (January 24). Mayor Morrissey's use of his time seeking government handouts is an ideal, if unintentional, tribute to a great son of Rockford, the economist Gordon Tullock. Forty-two years ago, in one of the most important papers published in economics during the 20th century, Tullock identified the phenomenon of "rent-seeking. "* Rent-seekers generate huge amounts of waste by using resources to plead for handouts. It's not so much the actual transfers from taxpayers to successful supplicants that are wasteful, Tullock showed, but the fact that the prospects of receiving these transfers prompt producers to form themselves into special-interest groups. These interest groups divert the time and resources that they, as producers, would have spent doing socially productive things - such as administering cities efficiently - into lobbying for government favors. Successful rent-seekers benefit, but the diversion of resources from productive uses into pleading and pandering at the feet of politicians makes society poorer. * Gordon Tullock, "The Welfare Costs of Tariffs, Monopolies and Theft," Western Economics Journal, Vol. 5, 1967, pp. 224-232. (It's a travesty that Gordon Tullock has never won the Nobel Prize).